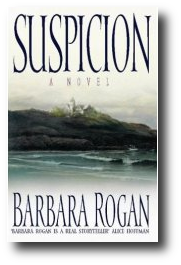 SUSPICION is the story of a writer named Emma Roth, who moves with her 10-year-old son and physicist husband to an isolated old Victorian on the North Shore of Long Island. No sooner do they move into their dream house than a series of bizarre, frightening incidents occur. Characters in a computer card game begin addressing cruel personal remarks to Emma. Her manuscript is tampered with, her home invaded. Their house is rumored to be haunted. Emma, herself a writer of ghost stories, doesn’t believe in ghosts. But if her house is not haunted, there are only two other possibilities: either Emma is losing her mind, or someone very close to her is out to destroy her. To read the first chapter of SUSPICION, go to Simonsays (hardcover).